Description: "That's a dead vampire, I though. My boss dragged me out of bed at two in the morning to see a dead vampire? I might be an Occult Special Investigator for Vancouver's Mystical Crime Lab, but a dead vampire is routine and no reason to dirturb a person's sleep. Then I took a closer look at the body..."
Tess Corday soon realises that there is not going to be anything ordinary about this case - not the lab results on the cause of death; not Mia Polanski, the teenage girl living at the address found in the vamp's pocket, who may well be in thrall to a demon; and certainly not Lucian Agrado, the necromancer who is liaison to the vampire community. Agrado is supposed to be part of the solution, but Tess suspects he might be part of the problem. My thoughts: I wish I'd picked Night Child up sooner. There's an excellent independent fantasy bookshop near me, and I've read the back of this book several times, but somehow never picked it up. Thankfully, I saw it for 2.99 last weekend and grabbed it straight away. Jes Battis kicks off the story with Tess looking at a body in the wee hours of the morning. There's apparently some tension between vampires & mages (like Tess & her team), which makes it a delicate situation to be doing a vampire postmortem. Tess has a review coming up, and her boss who seems to enjoy picking at her, is trying to get her to run this case exactly the way it's supposed to go. I like that she sticks to her convictions despite that. When Mia gets in touch with Tess and her partner Derrick, Tess sticks with what she thinks is right, even though it risks her losing her job. This is a constant through the book - Tess is of an age where she should normally be higher up in the structure of the OSIs, but she enjoys the job she's got, so she's stayed there. It was good to see a female lead who isn't the most magically powerful, or the biggest in the playground in other ways, but can still be described as 'strong'. I think there is potential there for us to learn more about her power in later books and for her to become more than she thinks she is - it reminds be a bit of the early Rachel Morgan books by Kim Harrison. I did find the early chapters a little slow going, but after a break of a couple of days, I really got in to it, and I hope to read the next one soon. 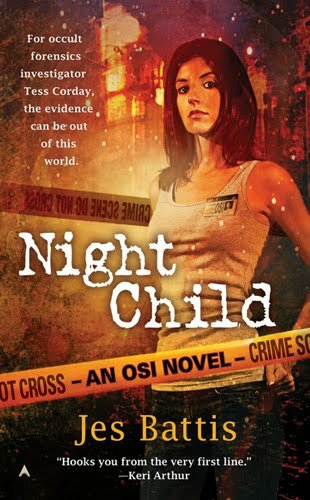 I don't want to say too much about the plot, because there are lots of twists and turns, but I'm interested to see where things go from here - a couple of incidents from Tess's past clearly affect her in this book, and I want to see if the events of Night Child change things. I really enjoyed this first book by Jes Battis, and I certainly plan on picking up book 2 in the OSI series, A Flash Of Hex, soon. I'd recommend it to fans of Kim Harrison and Tanya Huff. 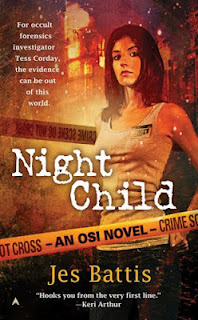 I give Night Child 7 out of 10. I understand what you mean about how refreshing it is to have a compelling heroine who isn't the "alpha" female. Great review! Oh wow this sounds pretty neat and I love the sounds of the protagonist. I also really dig this cover! I hadn't heard of this before but it's def. on my radar now! Stephanie - I know right! I get a bit bored seeing someone who is the best at lots of things, no matter how humble they are about it, being the heroine. Giselle - I really enjoyed it, you should check it out if you get the chance! I think there's four in the series so far, with another coming this year sometime. 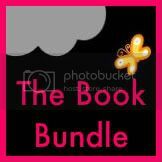 Giveaway: Want To Win A Kindle Fire?